Sir John Ambrose Fleming (1849–1945) was an English electrical engineer and physicist, known primarily for inventing in 1904 the first vacuum tube. It was also called a thermionic valve, vacuum diode, kenotron, thermionic tube, or Fleming valve. 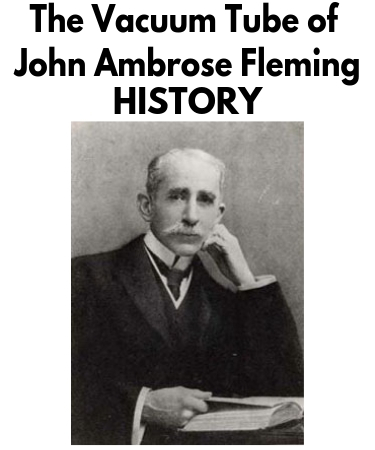 Fleming made numerous contributions not only to electronics, but also to photometry, electric measurements and wireless telegraphy. He became a consultant to the Edison Electric Light Company and a popular teacher at University College. He was knighted in 1929 for the many advances he had made to electrical and electronic engineering. Fleming was the author of more than a hundred scientific papers and books, including the influential "The Alternate Current Transformer" (1889), "The Principles of Electric Wave Telegraphy" (1906), "The Propagation of Electric Currents in Telephone and Telegraph Conductors" (1911) and "Memoirs of a Scientific Life" (1934). In the 1904 Fleming was granted a GB patent Nr 24850 (see the patent) for Improvements in Instruments for Detecting and Measuring Alternating Electric Currents for the prototype of vacuum tube, next year he received a US patent for the same device. This invention (see the nearby photo for one of the first vacuum diodes of Fleming) is often considered to have been the beginning of electronics, for this was the first vacuum tube. Fleming's diode was used in radio receivers and radars for many decades afterwards, until it was superseded by solid state electronic technology more than 50 years later. In the first half of the 20th century, vacuum tubes allowed the development of radio broadcasting, long-distance telephone service, television, and the first electronic digital computers (see ABC of Atanasoff and Colossus), which were the largest vacuum-tube systems ever built. Transistors have replaced them in virtually all applications, but they are still occasionally used in display devices for television sets and computers (cathode-ray tubes), in microwave ovens, and as high-frequency transmitters on space satellites. The Fleming's vacuum tube was based on an effect that Thomas Edison had first discovered in 1880s, and had not put to useful work at the time. One of Edison's inventors—William Joseph Hammer (1858-1934), working in Thomas Edison's laboratory, noted the rectifier effect when he added another electrode to a heated filament light bulb. Hammer was in charge of testing early light globes in 1880-81 and noted a blue glow around the positive pole in a vacuum bulb and a blackening of the wire and the bulb at the negative pole. This unknown phenomenon was first called "Hammer's Phantom Shadow," but when Edison patented the bulb in 1883 it became known as the "Edison Effect." The Fleming's vacuum tube essentially consisted of an incandescent light bulb with an extra electrode inside. When the bulb's filament is heated white-hot, electrons are boiled off its surface and into the vacuum inside the bulb. If the extra electrode (also called an "plate" or "anode") is made more positive than the hot filament, a direct current flows through the vacuum. And since the extra electrode is cold and the filament is hot, this current can only flow from the filament to the electrode, not the other way. So, AC signals can be converted into DC.